Earlier this year, we began looking at some of Newark's major industrial activities – products that carried the city's name across the country and around the world. So far we have sampled developments in the leather industry, brewing, and cotton thread manufacturing. Today, we follow up with a closer look at Newark's unbelievable jewelry manufacturing accomplishments, not only because that industry occupied an important place in Newark's industrial past, but also because the Newark Museum has just opened a 'glittering' exhibition on the subject. To complement the exhibit, the museum also has published a first-rate book, 'The Glitter and the Gold: Fashioning America's Jewelry' by Ulysses Grant Dietz, Jenna Weissman Joselit, J. Smead and Janet Zapata. Like they say in the commercial world, run, don't walk, to the Newark Museum to see the exhibition. If you have any interest in maintaining a personal library of Newark-related books, buy this one. It's filled with luxurious illustrations, photographs, maps, advertisements, illustrations from company catalogs, city directories and photography of all types, as well as original manuscripts from the museum's archives and neighboring institutions. Among the illustrations, you will find pictures of rings, brooches, necklaces, bracelets, buckles, chain purses, powder boxes, opera glasses, hair and bobby pins, combs, cufflinks, collar buttons, cameos and on and on. In addition, you will see glimpses of workspaces and workmen and catch a view of still another aspect of an astounding industrial emporium that was the Newark of another era. As we look back on the development of the Newark jewelry industry, we start with Benjamin Cleveland, who, in 1792, became our first known local silversmith. But it was really Epaphras Hinsdale who is credited with being 'Newark's first jeweler.' Hinsdale opened his Lafayette Street shop in 1801. Soon, John Taylor joined him as a partner. In 1811, Taylor became partner with Col. Isaac Baldwin, 'the first in the nation to undertake quality manufacture of American-made jewelry.' To achieve this distinction, the company had to persuade Americans that its products were as good as those stamped with the names of London or Paris. They were successful and soon earned a reputation equal to their European competitors. In 1838, another important Newark jewelry pioneer came on the scene. James Madison Durand, an enterprising young man, earned recognition as one of the nation's most important jewelry makers by the time of his death in 1895. Durand's great-grandfather was a skilled watchmaker in Essex County before the Revolutionary War. During his lifetime, he made several dozen trips to Europe to purchase gold, diamonds and other precious stones. He also was an innovator in women's jewelry design and is credited with having introduced pearls as high fashion by the mid-19th century. Craftsmen such as these soon earned the respect previously offered their European counterparts. In 1878, Joseph Atkinson's 'History of Newark' noted that 'Newark (had) become the great jewelry workshop on the American Continent, producing works of precious metals and stones, rivaling the beauty, finish and design not only of the richest handiwork of Europe, but the rare and exquisite jewelry, still preserved, of the Egyptians, Assyrians, Babylonians, Etruscans and Romans.' Besides having a good product, there were other reasons for the success of local artisans. Ulysses Grant Dietz points out that Newark craftsmen, besides being known for superior workmanship, were respected for their fair dealings with customers. He also notes that the nationally enforced protective tariff also helped the industry. Other favorable factors included the discovery of gold in California and the continued expansion of Newark's transportation facilities. Just as Newark's economy is helped today by the continued construction of roads and highways, the development of Port Newark, improvements at Newark International Airport, construction of a monorail and the projected construction of a light-rail transit system, the completion of a north-south rail link to other parts of the nation in the 1830s, the opening of the Morris Canal, and the emergence of the old trolley system in the latter part of the 19th century added to the development of industry in general. Ancillary industries also sprang up as a result of the emergence of the jewelry industry. Edward Balbach, an 1840s German immigrant, established in 1864 a precious metals retrieval system to handle gold and silver sweepings from factory floors, known as the Balbach Desilvering Process. Following the Civil War, Ferdinand J. Herpers became the first American jewelry maker to employ machinery to make gem settings. 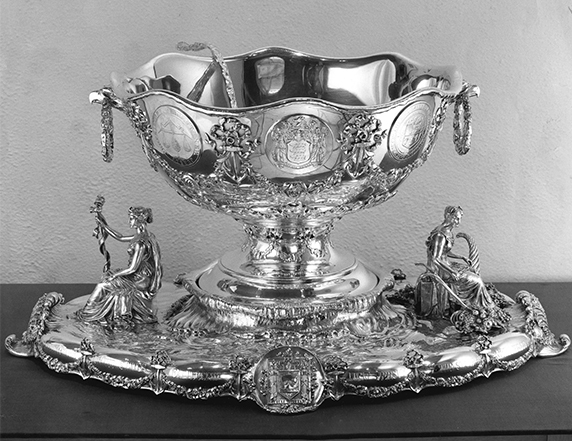 Others produced products closely associated with the precious metals industry such as clocks, tableware, watches and clock cases. Gold, silver and even platinum were now within the reach of the average person, and their possession was no longer reserved for the wealthy, royal or privileged. With the return of the Civil War veteran, there was a landslide demand for the simple gold wedding ring and other modest jewelry. According to the local newspaper, 'The eyes of the blind have been opened and dazzled by the brilliance of Newark workmanship, as displayed at Tiffany's and other great bazaars of New York.' At the great Newark Industrial Exhibition in 1872, jewelry was included in the industrial cornucopia of Newark-made products, including nearly $120,000 worth of diamond jewelry on display by the Durand Co.
Late in the century, all sorts of local developments occurred in the industry, including the discovery of how to set diamonds in rings for better display, the establishment of a platinum process, and the perfection of a seemingly simple but tremendously important collar button. To add to all this, another important jeweler, Daniel W. Baker, arrived on the industrial scene. As John T. Cunningham notes, in the period 'from 1880 to 1910, jewelry had become one of the city's top three industries. In fact, a 1919 survey showed that there were then 178 manufacturers in town, compared with only 30 in 1869.' To many, the sky seemed the limit, the factories were humming, and the everyday person was wearing jewelry as never before. But the recession of 1922 put a damper on production. And with the Great Depression of 1929 came the death of many of the old-time companies. Gold jewelry and precious stones were no match for unemployment lines and the near-desperation that faced many after the Wall Street crash. While many of the older names disappeared from the pages of city directories, a few continued, reorganized and survived. Two of the best-known companies that predated and survived the crash were Krementz and Tiffany. George Krementz began his Newark operations in 1866, winning acclaim for perfecting the one-piece collar button. So strongly did he believe in his product that he advertised, 'We will pay the cost of assay and furnish one dozen Krementz One-Piece Collar Buttons for every one which falls below the standard stamped upon it.' Indeed, the collar button was guaranteed 'against everything but loss.' At one time, 99 percent of all American collar buttons were made right here in Newark. But styles change. By the 1920s, when the celluloid collar and the button had become passe, Krementz fortunately had switched to making other kinds of jewelry. The company was established by J.A. Lebkuecher, later a Newark mayor, and George Krementz. It still operates under the Krementz name. By 1874, a complete line of gold jewelry was being made by a workforce of more than 100. By the beginning of this century, the firm was one of the nation's largest. In addition to the collar button, Krementz made bracelets, cufflinks, chains and pins of all types. Today Krementz is the sole survivor of this once-important and fascinating industry, operating out of a modern plant along McCarter Highway. At the other end of town was the Tiffany Co., one of the most attractive factories in Newark or, for that matter, any other industrial city. Built by Tiffany and Co. of New York, it operated from behind a 21-inch-thick wall of English bricks and looked like a Norman castle. Tiffany's tower was designed to hold a 23,000-gallon water tank. The building was self-sustaining, needing only a regular delivery of coal to generate heat and electricity. Within its walls, the company made all of its world-famous silver flatware, its well-known stationery and its famous blue Tiffany boxes. Two decades ago, the company changed ownership. In 1984, the factory was sold. Gone forever were the craftsmen who make precious items distributed around the world. Today, the main portion of the old factory has been converted to upscale condos. The periphery is encircled by modern townhouses. But the memory of a great industry lives on in the book connected to the current museum exhibit and in the exhibition itself. Both intrigue me, making me want to run out and buy one of those wonderful pieces of Newark-made jewelry in order to hold on to a bit of the past. Better yet, why not pick up one of the fine reproductions at the museum's gift shop to help remember the era of Newark's 'glitter and gold'?